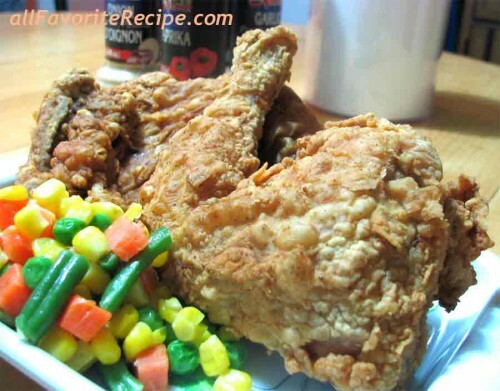 Fried chicken is a chicken that is cut up, dredged in flour or dipped in a breaded mixture and then pan fried, deep-fried, or pressure cooked until golden brown. Fried chicken has many recipe variations and some had their own tricks and special touches just to have a perfect fried chicken. Some people remove the skin before battering; others fry in oil, in butter and others in lard or bacon grease just to get that perfect taste. The fried chicken recipe version that I made was marinated overnight with buttermilk. The buttermilk tenderizes the chicken and giving a rich, slightly tangy flavor. The trick that I did in cooking this fried chicken is making the oil temperature even. I use a deep-fry thermometer that was always kept in the pot and let the temperature remain between 300°F and 350°F at all times. I make sure that the oil does not get too hot; otherwise the color of the coat will turn dark before the chicken is actually done. Try it yourself and taste the difference. Combine buttermilk (if using), salt and pepper in a bowl or in a large airtight container. Place the chicken pieces, turning to coat in the liquid. Cover and refrigerate for at least an hour or two, or overnight. 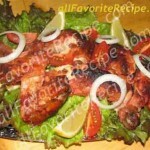 In a large shallow platter, mix the flour, garlic powder, onion powder, paprika, cayenne, and sugar until well blended. Season generously with salt and pepper. In another bowl, beat eggs with hot sauce (if using) and season with salt and pepper. Remove the chicken from the marinade and one at a time, dip chicken pieces in egg mixture, turning to coat and then dredge the pieces into the seasoned flour and coat it well. Shake off the excess flour. 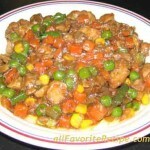 Repeat the coating process with the remaining chicken pieces. Place coated chicken on a clean plate or tray, or on a large wire rack set over a sheet pan and let rest until ready to fry, at least 20 minutes. Heat oil in a fryer (or a medium Dutch oven, or in a heavy pot). Using a frying thermometer to measure temperature, bring oil to 350°F. It should be at medium, not a rolling boil. (NOTE: An even oil temperature is the key to success. A clip-on candy or a deep-fry thermometer should be kept in the pot. The temperature should remain between 300°F and 350°F at all times). Make sure that your oil does not get too hot, otherwise the color of the coat will turn dark before the chicken is actually done. Use tongs to place chickens in hot oil, in batches if necessary in able not to drop the temperature. Fry until the coating is golden brown and crisp. Remember that dark meat requires a longer cooking time about 13 to 14 minutes, compared to 8 to 10 minutes for white meat. An instant-read thermometer inserted should register 170°F internal temperature. Drain fried chickens on a cooling rack (or on several layered paper towels). Using a slotted spoon, remove any bits of coating left in the fryer and discard. Repeat the frying process with the remaining chicken pieces. Allow the chicken to rest at least 5 minutes before serving. Transfer to a serving dish and serve. Prepare as directed, adding 1 tablespoon chili powder to seasoned flour. Prepare as directed, adding 2 to 3 teaspoons curry powder and 1/4 teaspoon ginger to seasoned flour. Prepare as directed, reducing flour in seasoned flour to 1 cup and adding 1/2 cup finely grated Parmesan cheese and 1 tablespoon oregano or marjoram.